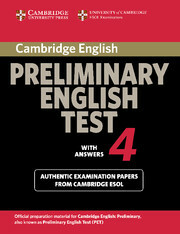  Contains four complete model papers from University of Cambridge ESOL Examinations for the updated examination (from March 2004) providing the most authentic exam preparation available. Familiarises students thoroughly with the content and format of the updated PET examination. Includes a comprehensive section of keys and tapescripts making it ideal for self-study use.